You see posts getting hundreds of likes and comments in your Facebook newsfeed. You think, how the heck are these posts going viral? Want to know the secrets for making your own Facebook posts go viral? I will reveal strategies below to increase your chance of Facebook Post success! Now, that is awesomesauce! Say, YES to success. Means you gotta work with me here, you must read everything below then do your research, start getting your creative juices flowing!! Get in the creative flow- however you do that, whether it’s smacking a certain part of your body, chanting etc… I learn a new technique everyday, some are interesting to say the least lol My creative flow technique is simple, I read and think. Say, awesomesauce! Show your excitement about a current event this covertly associates your brand with the event. For example, look at how many brands are discussing the Olympics in their content or even commercials. 2.) Relate To Your Audience- Use Your Marketing Psychic Ability! lol You can read minds, what, you didn’t know?………..
You have seen posts on Facebook and thought, “How did they know I was experiencing that, thinking or feeling that!! The universe must have wanted me to see this message!” lol 😉 That’s is how you relate to your audience and that is how excellent marketing is done. BAM! Combine humor with an idea or experience that people can relate to, that is the secret formula. BAM! Associating your brand or product with a strong emotion such as love and you will see results. Use a photo, video or text; the goal is to get people FEEL. Ask questions or get people to do a action are both ways to get your fans to like or comment on your post. People love to share something that triggered a emotion within them, whether it was inspiration or insight; they will most likely share it with their friends. whether it be inside jokes in your industry or experiences that everyone has experienced and is too embarrassed to admit or discuss or encourage fans to submit funny photos. 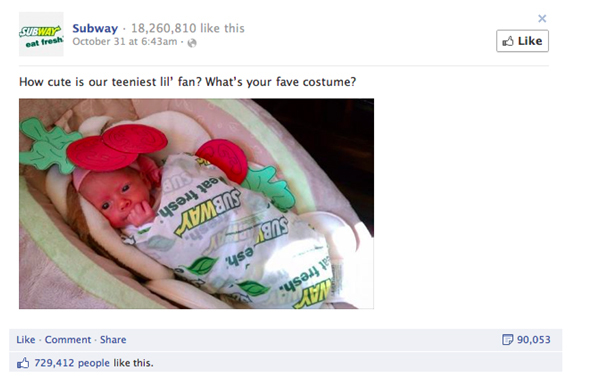 For example, a customer submitted a photo of their baby wrapped in a Subway sandwich wrapper. Subway shared it and look at the results. 6.) Inspire Them, Motivate Them!! Using a great quote can trigger strong emotions. An inspiring quote and image will motivate your audience, increasing your chances of getting them to share with their friends. 7.) Give Away Great Prizes! Keep in mind there are a lot of companies doing this now so your prize has to be unique and something that everyone wants and desires. This will increase your chances of it going viral! For example, Skittles had a contest giving away a Skittle vending machine, and the contest post accumulated over 12K likes. Have fun incorporating these strategies and share with us your experiences, insight or ideas! Have you ever had a post go viral? What was it that made the post go viral? Share your viral post below so we can take a look! and it will drive more traffic to your page!! BAM! Say, “AWESOMESAUCE”!